One lesser known garage flooring option available today is the RaceDay self-stick vinyl garage floor tiles. If you like the idea of vinyl composite tiles, but without the hassles of applying glue during installation and the ongoing maintenance of stripping and re-waxing of the floor, then this sticky tile is worth a serious look. Manufactured by Better Life Technology, this is the same company that makes the high quality G-Floor garage floor mats. Made of polyvinyl, these flexible tiles are .095 mils thick (slightly thicker than a nickel) and have an adhesive pressure sensitive backing. The adhesive is exposed by peeling off the release paper on the back of the tile. 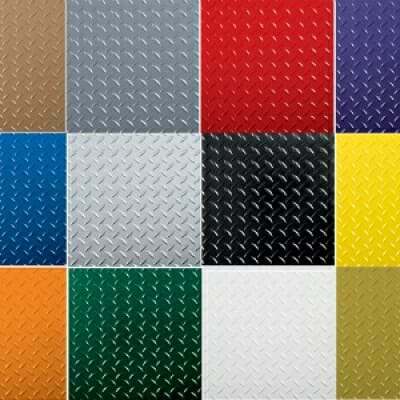 They are available in 12”x12” and 24”x24” sizes in a diamond tread pattern with twelve different semi-gloss colors to choose from. 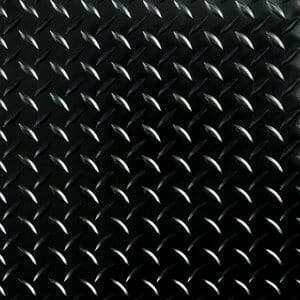 An additional smooth levant tread pattern is also available, but in the traditional black, gray, and white colors only. The levant pattern has a more satin finish however. An important note to make is that RaceDay self-stick tiles, unlike others on the market, are made of 100% solid polyvinyl construction that is non-porous. This makes them extremely tough and resistant to oil, road salts, anti-freeze, battery acid, and most other liquids that your car can deposit on the surface. Many competitors use a multi-ply laminated construction with cheap fillers in the middle in order to save money on materials. 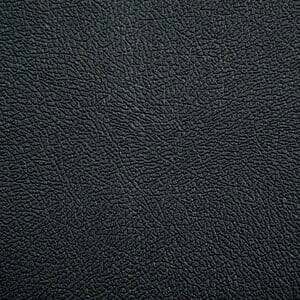 What you get is a tile with only a thin layer of quality polyvinyl at the surface. This type of construction is not nearly as tough as the Raceday tile and has been known to delaminate after a while under use. 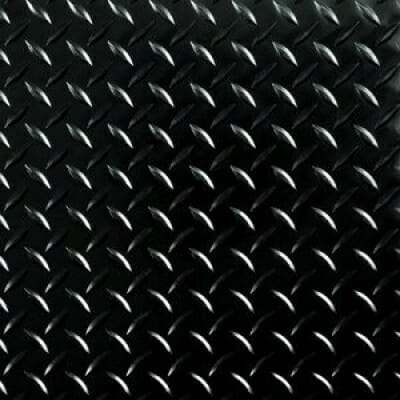 The diamond tread pattern can provide extra grip when needed and stands up well to a traditional garage floor environment. The thick vinyl construction absorbs sound, helps to insulate from the cold, conforms well to the floor, and unlike VCT garage floors, it delivers some anti-fatigue benefits as well. Additionally, peel and stick garage floor tiles are easy to clean. Oil and other liquids just wipe right up. A dust mop or soft bristle broom works best for the light dirt and debris. Heavier cleaning can be done with a mop and mild solution of Mr. Clean or other ammonia free cleaners. Non-slip vinyl floor cleaners can be used as well. Lastly, Better Life Technology claims that the non-porous construction virtually seals your garage floor from the elements when installed correctly. Plus, they will not crack or chip like other flooring can and they come with a 5 year limited manufacturer warranty. As nice as these self-stick garage tiles are however, they are not perfect and do have some characteristics to be aware of. The first is that the diamond tread pattern does not always line up perfectly when laying the tiles together. It is much less noticeable however if you are doing alternating colors such as a checker design for example. Also, just like VCT garage flooring, vinyl self-stick tiles can be spun loose by a vehicle if you turn the front wheels while not moving. This is simple to avoid however if you insure the vehicle is moving, even ever so slightly, while you are turning the wheels. Some liquids can stain if left to puddle untreated for long periods of time and ink, dyes, and harsh chemicals are known to stain the tiles also. Another matter that has been encountered with peel and stick tiles is the occasional edge that wants to lift. Most often this is due to the floor not being cleaned and prepped properly. This is usually remedied though with some spray-on 3m glue applied to the underside edge of the tile. Finally there is the issue of tire stain marks. Contrary to some publications’ comments, polyvinyl self-stick garage floor tiles are susceptible to tire marks – just like garage floor mats. High performance tires and some all season tires are the biggest culprits. RaceDay peel and stick tile is manufactured of the same high quality polyvinyl (only thicker) that is used for G-Floor garage floor mats. And just like garage floor mats, the darker color tiles do much better at hiding the tire marks than the lighter colors. If you have a fairly busy garage environment or don’t want to worry about possible tire marks in the tile, Better Life Technology does offer additional protection against tire marks and stains however. They recommend applying their G-Floor Top Coat Stain Blocker. It’s a 2-Part epoxy sealer that is mixed together and rolled onto the surface. 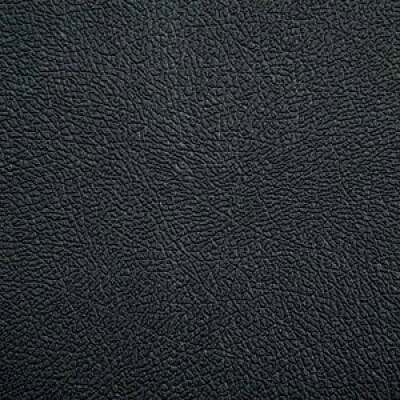 It’s made specifically for vinyl and helps to protect the tile against tire marks and other liquids that can stain. Hilway Direct is another source that makes an excellent product at protecting polyvinyl from stains. You can find it here. It’s an acrylic sealer that is easily applied with a mop. It’s available in both a glossy finish and a satin finish if you don’t care as much for the glossy look. While the actual installation of this tile can be easy, the floor preparation required is consistent with that of vinyl composite tile. The concrete needs to be cleaned thoroughly, be free of oil and dust, and all large gaps such as contraction joints, divots, and large cracks, need to be filled and smoothed out. Any sharp raised edges should be knocked down as well. Saw cuts in the concrete will not affect the tile. If the large gaps are not filled, it will cause the tile to pull away from its neighbor as you drive or walk over it. This happens because the tile can be pushed into the gap due to its flexibility. A self-leveling underlayment works well in this case for filling contraction joints and can be found at most home improvement centers. Though peel and stick tile can be applied directly to the bare concrete, Better Life Technology recommends applying a concrete primer first to achieve the best result. Failure to do so will void the warranty. Behr 880 Primer is a good example. Once the floor is clean and dry, you will need to draw or snap a line down the center of your garage floor for reference. It’s generally a good idea to lay the tile out in a dry run to see how things will line up. Now the real fun begins! Just peel the paper release from the back of the vinyl tile and stick it to the floor using your reference line as a guide. Once your first row is laid, you are on your way. If you make a mistake, the tile can be lifted by using a blow drier to the surface of the tile to soften the glue underneath. All straight cuts should be made using a utility knife and a straight edge. Also, be sure to press out all air gaps in each tile before moving on to the next. A rolling pin can make simple work of this. Full instructions for application are supplied with purchase, including cleaning instructions. There are many places to purchase RaceDay peel and stick garage tiles. While we are not a fan of warehouse clubs, we have found that some do sell this tile for a fairly good price. Keep in mind however that warehouse clubs will not be able to answer any questions you may have, including those about installation. Another great source is Garage Flooring LLC. They are a large vendor and distributor for Better Life Technology and have a wealth of knowledge when it comes to their products, including installation tips. They will also provide samples free of charge for you to examine and to help determine color choice. They ship for free and have a low price guarantee on all advertised pricing. Though most warehouse clubs don’t advertise prices for this tile, we are fairly confident that they will work with you if you think you have found a better overall price. 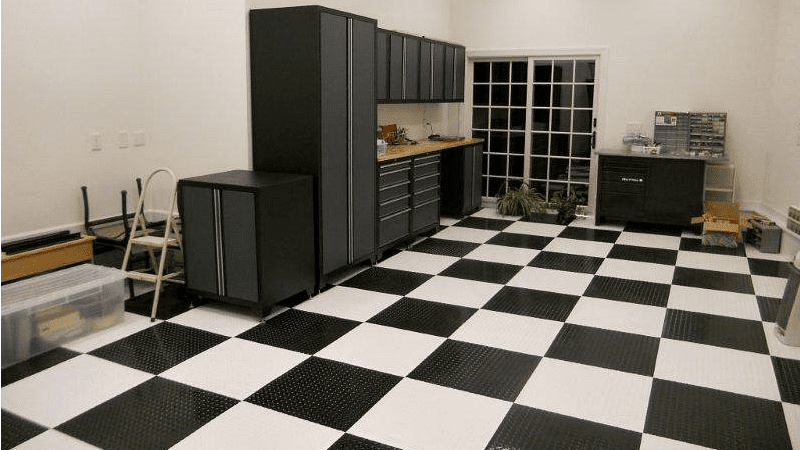 If you like the idea of a custom garage floor look, along with the advantages that tough vinyl flooring for a garage can provide, then the RaceDay peel and stick tiles may be for you. 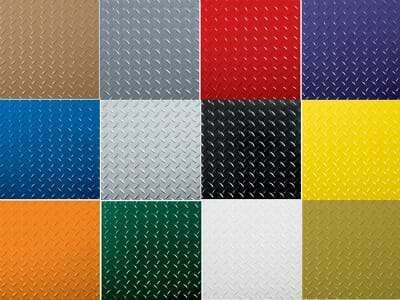 With the numerous colors that are available, it makes it easy as well as fun to custom design your garage floor dependent upon your tastes. Reports of how well self-stick tiles stay put has generally been very good. They provide a nice finish and without all the routine maintenance of stripping and waxing a vinyl composite garage floor. Plus, you get the added benefit of better light reflection off the floor. If you are one to fret about tire marks however, we highly recommend going the extra step and apply one of the stain blocking protective coats that are available. Either that or at least strategically plan for black tiles where your car tires will sit. Finally, be sure to get any questions that you may have answered before purchase and application. This is where the benefits of a good garage flooring vendor will pay off. Good customer service will go a long way in making your garage flooring choice and installation a more satisfying experience. 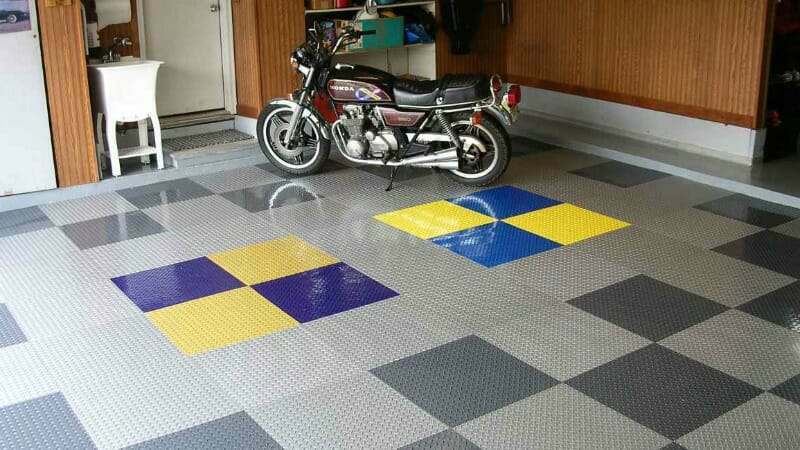 Can you drive on the peel and stick tiles after installing it on your garage floor? Hi Justeen. Yes, you can drive on them. That is what they have been designed for. I just painted my garage floor with 1-part epoxy and having a problem when rains…hot wet tires pull some paint. Can I use peel and stick tiles … I mean will they stick to the epoxy? And if yes how long will they last? Hi Elmar. Yes, you can apply the G-Floor Race Day peel and stick tiles to epoxy as long as it is nice and clean. Keep in mind however that the tile is sticking to the epoxy, not the concrete. So how well they stay adhered is dependent on how well the epoxy does on the concrete. These tiles are designed to last for years. We haven’t heard of anyone that has actually worn out a tile yet. That sounds like the case Elmar. How did you prep the concrete before application? If the paint has not achieved a good bond, water can have this effect. It’s best to wait at least 24 hours, even longer depending on temps and humidity, before applying a coating after prepping a floor in this fashion. Fans help. The surface not only needs to be dry, but the moisture still within the concrete needs to rise to the surface and evaporate as well. I would suspect that the epoxy paint didn’t achieve a good enough bond Elmar. The drying process between the paint and the tires when it is wet may be causing the coating to stick to the tire and then pull it up. You may not have the type of tread design in your tire that will grip the paint real well when the tire is dry as it cools, though it could be loosening the bond at the surface. Then when you pull in wet, the paint sticks to the tire as it dries and pulls up when you back out. If you are thinking about the peel and stick tiles, you may want to take a scraper to the epoxy paint and see how well it holds up. If it starts to come up in sheets in some areas, you would be better off removing the coating first. Out of curiosity, what brand 1-Part epoxy paint did you use? I put down the rust oleum epoxy and having problems with it drying after two weeks it is still sticky in spots. What to do? can I apply the peel and stick piles to it? No you can’t Tommy. If those spots haven’t cured in two weeks time they never will. You will need to scrape up the soft spots first before you apply anything to the floor. Yes, I’ve been thinking to place peel and stick tiles to the areas under the tires (there are some cheap on sale at the moment on rubberflooringinc.com – 10 bucks per 20 sq. feet), and if it starts to come up in sheets, then I remove the paint and stick more expensive ones (like diamond pattern) directly to the concrete. Can a floor jack be used on these tiles without causing damage to the tiles? Hi Steven. Yes, you can use floor jacks on these tiles. You just don’t want to leave the weight of the car on the jack for long periods of time. If you use jack stands, be sure to use stands that have a flat platform bottom. If they have pointed legs, place a piece of plywood or something similar under the stand or the pointed legs can damage the tile. Where can I purchase the peel and stick tiles? Hi Robert. Garage Flooring LLC seems to have the best price going on these right now. You can find them here. That’s good to hear Elmar. Unfortunately we don’t have a way to post images in the comments section. Great job of being creative! Can a 4 post 8,000 lb capacity lift be placed on the peel & stick tile floor? Yes it can Joe. Just make sure to anchor it though. If not, the tiles could “walk” slightly under the weight if the lift wants to move at all. Is there any special preparation before installing the peel & stick tiles over an epoxy painted garage floor? Hello Joe. As long as the floor is clean they can go on without any additional prep. Do you have to fill in the concrete control joints? It depends on what type of contraction joints you have Joe. If they are saw cut joints that are only 1/8″ wide or so, then no, it’s not necessary. If they are troweled joints that are 1/2″ to 1″ wide, then yes. Since the tiles are flexible, driving over these joints will push the tile down into them over time. This will create depressions in the tile and cause them to pull away from the edges of neighboring tiles. Since you are just covering the joints, you can easily fill them with some inexpensive self-leveling concrete mix. It will crack in the joints, but that’s OK. The idea is to fill the valley under the tile in order give it support. These are great points Justin. We did include these in our latest update, but it’s always important to make sure people fully understand the requirements and characteristics of each flooring option. Need assistance on order of prep work. We have a 20+ year old concrete garage floor (22′ X 22′). I don’t believe there was ever any sealant. We are planning to scrub with TSP. After reading this page, I think we should then fill in expansion joints, then prime, then tiles. Is that correct? Hello Gail. You are correct! Would lake to install tile in a apt. corridor,now we have carpet on concrete slab, the question I have if it is practical and the looks. Hello Ernest. There are other manufacturers of peel-and-stick vinyl tile that may be more practical for an apartment corridor. Armstrong is an example. You can find examples at your local home improvement centers as well. Self stick tile requires a clean, bare, concrete surface. Any carpet glue or mastic would need to be removed first. we had some tiles come up,what can be used to glue the tiles down? Hello Jo. Self-stick tiles adhere to the surface using a pressure sensitive adhesive backing. Assuming the surface they were stuck to is clean, many times they can be adhered again by applying heavy pressure across the surface once they have been placed. Standing on the tile does not work because the pressure is spread out across the shoe. It needs to be done using a vinyl floor roller. Sometimes you can rent these at your local home improvement center. Some are weighted while others require that you apply the pressure yourself. If that doesn’t work, then the last alternative would be to use a spray adhesive. Yes they can Linda. If you will be tracking in road salts and deicing fluids, it would be a benefit to treat the tiles first with an acrylic sealer. To add to this question, will they expand and contract in winter and result in less overall life span? Vinyl tiles will expand and contract, though ever so slightly Jason. Because they are glued down it’s not as big an issue as it would be if it was a free floating floor. Where in Alberta Canada can I possibly order your product. Or what contact info for out of country ordering. Hello Jim. You need to contact Better Life Technologies. 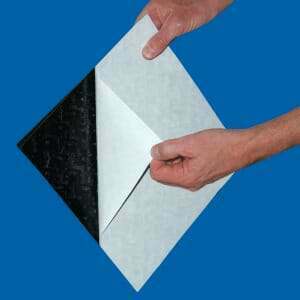 They manufacture the peel and stick tile can direct you to a distributor near you or one that can ship to you. I have fairly old concrete that has been painted (not epoxy). The paint is peeling/chipping in a few areas. Do you I need to strip all the paint from the concrete before installing the peel & stick tiles? Hello Elena. At minimum you need to remove as much as it as you can with a scraper. How well the tiles stay adhered all depends on what they are adhered to. If the paint is peeling, the tiles will come right up with it. I want to use the self stick tiles in my garage The manufacturer recommends stripping the epoxy off and priming with Behr 880 even though the epoxy is in good shape Has anyone ever used self stick over epoxy and if so how were the results? Hello Jerry. We don’t see why you couldn’t apply the Behr 880 primer to the epoxy. All that would be required is to rough up the surface of the epoxy with 100 grit sandpaper in order for the primer to obtain a mechanical bite to adhere. The tile then adheres to the Behr primer. If you have any other questions about the tile, we recommend giving Justin from Garage Flooring LLC a call. He has a lot of experience with this tile and he can give you any additional information that you should be aware of. I don’t know Anu. The information you provided does not list the square footage of your garage floor. Where can I buy the race day peel and stick garage floor tiles? Hello Spencer. You can by RaceDay peel and stick tiles here. Is there a “minimum temperature requirement” for installing self stick tiles? I want to install these this fall/winter in a non-insulated garage. I can temporarily warm the garage with a propane heater but concrete floor may still be cool to the touch. Hello Jeff. You actually ask a good question and it required that we place a call with the manufacturer. They state that the tiles should be stored at a room temperature of no less than 65 degrees for 48 hours prior to installation and that they should not be installed on concrete with a surface temperature of less than 55 degrees. If you heat the room for a few days the concrete surface temperature may come up. We found that an inexpensive infared thermometer works well for checking concrete surface temperatures. I am interested in using your product but am concerned about the tiles “creeping” when I enter the garage and stop the car. Currently have tile on the floor that has moved due to stopping even though we try to stop slowly. Will these self adhesive tiles creep from “normal” stopping?? Hi Bill. Just to avoid any confusion, we don’t sell or install product. You can purchase these tiles from Garage Flooring LLC or BLT Technologies direct. In terms of the tiles creeping, we have not heard of any such issues. However, it could be possible if the tiles are not adhered properly. Do you sell these with a smooth finish? Rolling toolboxes and motorcycle lifts will not smoothly glide over the rough faux diamond plate pattern, and that’s a big problem. Hi Charles. Because we are an informational website only, we do not sell product. However, you can purchase these in a Levant pattern (smooth) from Garage Flooring LLC. You can find them here. Can peel and stick tiles be installed on heated concrete garage floors? Hello Ed. Yes, you can apply peel-and-stick tiles to heated floors. Is there any concern that the exposed edge near the garage door may lift if any rain/moisture comes in when the garage door is opened? Hello Doug. You can always glue down a vinyl transition edge strip for the leading edge into the garage. These are popular to use for VCT tiles as well. This here is and example.